The Long Classic Triple Ring Vaginal Probe is for use with EMG and Stimulation machines that help to strengthen and tone the pelvic floor muscles. Three electrodes towards the top of the probe are made from high quality stainless steel and offer more powerful stimulation than 2-electrode probes. It's ideal for women who have already started strengthening their pelvic floor and want to step up their workout to further increase their muscle tone. This probe is also perfect for use in conjunction with a physiotherapist as it can be used with a reference electrode for biofeedback. To use with a Kegel8 or other electronic pelvic floor exerciser, connect the black and red wires of the probe to your lead wire. If you are using this probe with a reference electrode with a biofeedback device, attach your reference electrode to the green wire. There are no hard and fast rules about which probe you should use; it depends on your body and what you feel comfortable with, so it may be a case of trial and error. This probe, however, is relatively large at 140mm long, which allows for deep insertion so that the there is optimum connectivity between the electrodes and the bed of the pelvic floor. The top is smooth and round which makes insertion easy and comfortable for any woman, and the durable ABS plastic that this probe is constructed from makes it easy to clean, reliable and durable. 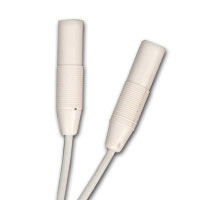 This probe is fitted with 2mm male pigtail connectors and is compatible with most STIM/EMG machines via your leadwire.